It was a somber day at Redskins Park when the players that worked through adversity for much of the year had to come to terms with the fact that their season was over. The close-knit group sat around playing cards to try and delay the inevitable exit interviews and cleaning out of lockers that would officially end their season. Mason Foster put it best on Twitter by posting the picture to the right with the caption “THEM BOYS ARE HAVIN THE TIME OF THEIR LIVES” from Varsity Blues to underscore the special bond the team has developed. 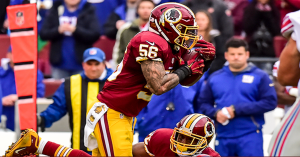 When the Washington Redskins season came to a sudden end at the hands of the Green Bay Packers Sunday afternoon, heartbreak fell over the DMV. 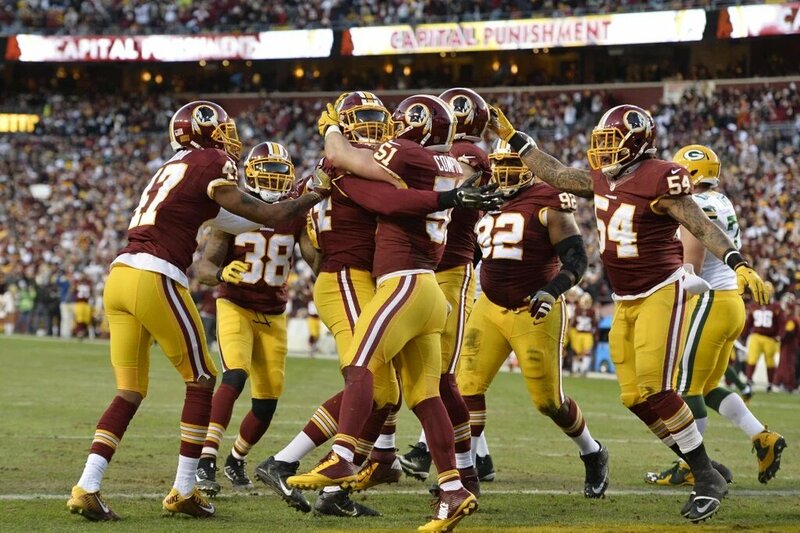 The reality is that the Redskins were a much improved football team and no longer the laughing stock of the league. With Scot McCloughan at the helm, Redskins fans should feel confident about the stability of the franchise for the first time in years. 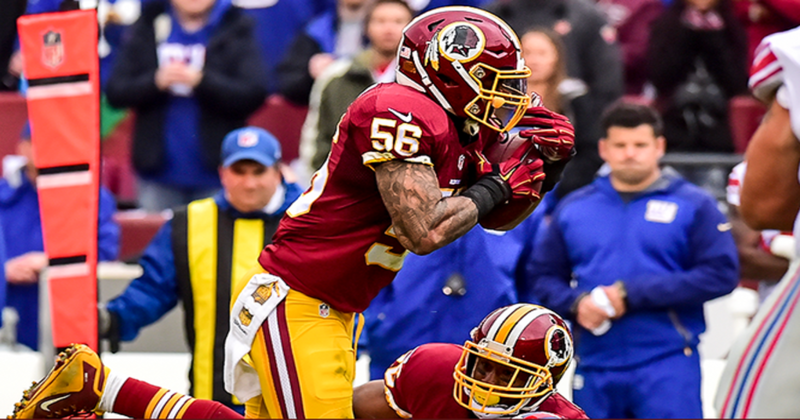 In just the fourth game of the regular season, the Washington Redskins were already in a must-win situation if they wished to stay relevant in the weakened NFC East. With their second straight divisional opponent in the Philadelphia Eagles, Washington knew the magnitude of the game. The Redskins got off to another hot start in the first half, before having a let down in the third quarter possibly due to injuries to Chris Culliver and Ryan Kerrigan. Before it was too late, the Redskins did something they rarely have done lately: they came back to win the football game after losing all momentum. Washington is 2-2 and looking for a possibility to be tied for first place in the NFC East after a 23-20 victory over the Eagles. Alfred Morris was the best draft pick by the Washington Redskins in a long time. The Florida Atlantic product was taken in the sixth round and was known for not being able to hold on to the football. So what does he do? Rushes for 3,962 yards on 4.5 yards per carry, 28 touchdowns, and just 11 fumbles in his young three year career. How is Morris rewarded by new general manager Scot McCloughan? The drafting of a big and physical runner by the name of Matt Jones in the third round. Unlike what many may think, Matt Jones is not here to take away Morris’s job, at least for now. Beyond this season may be a different story as Morris will be an unrestricted free agent next summer. However, both head coach Jay Gruden and McCloughan have openly stated that they would love to have Alfred back and possibly as a career long Redskin. A big factor for Morris’s future will be how he can adjust and perform in the power blocking scheme of offensive line coach Bill Callahan, as opposed to the zone running scheme he used to run under Mike and Kyle Shanahan. Some have faulted Morris’s drop in yards per carry from 4.73 in his first two seasons to 4.05 last year to his reliance on athletic quarterback Robert Griffin III drawing extra defenders and/or the toll of 876 carries in a short career taking effect. In essence it might just be a make or break year for Morris this season as it is with many players held over from the pre-McCloughan regime. Regardless, Morris will be given every opportunity, like Griffin, to return to 2012 form in an attempt to revive a franchise. That said, Matt Jones will see lots of playing time and not just as a third down back. As a physical runner, Jones is well suited for Callahan’s power run game. Just look at what he did to Texans CB Kevin Johnson that is believed to have started brawls the next day. Jones will probably be heavily evaluated during the preseason, assuming he gets over his tweaked knee injury, which Gruden said is not too much to worry about. From their, Jones could develop into simply the back that gives Morris a breather to splitting carries with the Redskins’ work horse. Time will tell but whatever it is, Jones is likely to have a significant impact on the Redskins offense this year. The Redskins have traditionally only utilized two running backs at a time although always keeping a third available on the active roster. Matt Jones took the backup spot relinquished by Roy Helu Jr. who opted to sign with the Oakland Raiders this off season, but the third string running back spot is still up in the air. Chris Thompson has had injuries hamper a possibly promising career with the Redskins. The speedster out of Florida State made the team as a fifth round pick his rookie year but later lost his return specialist role to Josh Morgan for ineffectiveness. Thompson would later have his season cut short due to a torn left labrum injury. Last year, Thompson was also dealing with nagging injuries during the offseason which seemed to keep him from performing at his potential. He lost the third-string running back position to rookie Silas Redd but wound up on the team’s practice squad. Things seem to be different this year as Thompson is healthy and ready to go. Gruden has already given the 24 year old high praise. There is still a lot of time before the cuts to a 53 man roster have to be made including four preseason encounters, but Thompson has put himself firmly in control of his own destiny. Thompson was also listed third on the team’s first official depth chart behind Morris and Jones, but ahead of his competition in Redd and another speedster Trey Williams. Silas Redd is an overall good running back, but lacks the excellence in any particular area as a running back to take his game to the next level. Williams on the other hand is lightning quick and could leave Thompson in his dust; however at 5′ 7” and 175 pounds, it is possible that Williams’s body would not be able to withstand repeated punishing hits of NFL defenders. With Thompson also listed as the third string kick returner behind WRs Andre Roberts and Jamison Crowder, the FSU product is all but ensured a roster spot (barring injury *knock on wood*). All of this conversation about a third string running back might be mostly irrelevant during the season as Morris and Jones are guaranteed to carry the load. Thompson however, provides the change of pace speed that the Redskins will do without in the loss of Helu. It should be noted that although not discussed as a back, FB Darrel Young will continue in his role as a primary blocker and short yardage carrier on dive plays. Come back and visit District Sports Page for the next position outlook on receivers tomorrow. 1. Colt McCoy takes possibly his last opportunity to start and shines. There are many nitpicky issues that can be found in McCoy’s game from not turning turnovers into points and underthrowing Desean Jackson, but this kid went out and played a great game. Having just a mere week of practice with the starting weapons McCoy settled into the system and executed the game plan. The Texas product returning home completed over 80% of his passes for a grand total of 299 yards. McCoy was able to get the ball to DeSean Jackson deep multiple times and the completion was the most important part. Additionally, McCoy bounced back after halftime when trailing by leading an impressive touchdown drive overcoming usual drive derailing penalties. Then after Dallas ties it back up he takes his squad right back down the field, puts his body on the line on third down to get the score on a quarterback draw. Then after struggling to get a score at the end of the game he came out in overtime firing and marched his team into field goal position where Kai Forbath ended up having the game winning points. McCoy had a heck of a game and maybe has given his career some kind of a jolt, just probably not in Washington though. 2. Defense plays great when Romo is in, a good thing he comes back in. How well the defense played without Brian Orakpo and DeAngelo Hall is not describable in words. Even when the ball was moved against them early in the game they were able to get stops or cause turnovers to end Dallas drives. The wheels began to come off when Brandon Weeden came into the game as missed tackles and blown coverages led to 10 points for the Cowboys. However, as Jerry Jones wanted his prized possession in Tony Romo returned to the game, a great sign for the Redskins defense. The Redskins were able to harass Romo all game especially in key moments in the game on third downs. Not only at the end of regulation, but the defense stopped the Cowboys from getting TWO yards on three plays to end the game in overtime. The Redskins got five sacks on Romo as well as two turnovers when they could have had many more. All in all the defense did their part in picking up their best win of the year. 3. Redskins coaching staff is the unsung hero. Not only did Jay Gruden provide a good game plan for Colt McCoy to succeed. Although several runs on first down did not amount to much on the ground, it set up deep play action bombs to DeSean Jackson. Even gutsier was his decision to go for a fourth down and one by throwing to Darrel Young in the flat. However, I think the best play calling came from defensive coordinator Jim Haslett who was able to unleash imaginative stunts and blitzes that came through in the clutch against Dallas. Haslett used Brandon Merriweather strength as an aggressor as well as Perry Riley and Keenan Robinson to end Dallas drives with sacks instead of getting beat down the field. This attests to Haslett’s trust in his young 22 year old corners of David Amerson and Baushad Breeland who played their best games of their young career. 4. The Redskins continue to get their money’s worth out of DeSean Jackson. Desean Jackson was NOT a big money bust under Dan Snyder thus far as he game in and game out has an impact on the game with his speed. On seven targets, Jackson had six completions for a whopping 136 yards, which could have been more if McCoy had a stronger arm. If the Redskins are to go on any kind of a run to try and make the playoffs, then Jackson will clearly play a big role in that. Moreover, Jackson will be able to contribute to this potentially high octane offense for the next couple year as well. 5. Robert Griffin III’s return has been delayed. Many are glad that Griffin was not rushed back this season as he clearly was to start last season. Additionally, because he was inactive for this game many think he will not come back until after the bye. I think that has turned into a clear wait as McCoy has shown himself to be more than capable to play in the NFL. As a result, I expect him to start against a lesser opponent in the Minnesota Vikings last year. However, as much as the fans will give their good graces to McCoy right now, Griffin will be back under center at home against Tampa Bay barring a tragedy. The Washington Redskins have their final preseason game of 2014 on Thursday at Raymond James Stadium against the Tampa Bay Buccaneers. 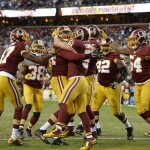 The Redskins are coming off of a 23-17 road loss to the Baltimore Ravens last Saturday. Washington is 2-1 this preseason and the Buccaneers are 1-2 after beating the Buffalo Bills 27-14 on the road on Saturday.